While AWEX comments on Thursday noted that the market had steadied there is no denying the market again suffered from a lack of buying demand. Reduced offering and falling prices across the board were the end result of what has been a perplexing 6-week period. The Eastern Market Indicator (EMI) fell 76 cents to accumulate a 200 cent fall over the past 4 weeks, ending the week at 1,776 cents. The Au$ was again stronger up almost 2.1%; the EMI in US$ terms fell by 29 cents to end the week at 1,293 US cents (Table 1). This puts the US$ EMI back exactly where it was one year ago, and with a dramatically reduced supply year-on-year the conclusion can only be that demand has fallen – at least for the immediate timeframe. In Fremantle, the Western Market Indicator (WMI) lost ground, falling 74 cents on the back of the last two week’s 89 cents falls to end the week at 1931 cents. Compared to the original roster posted last week, only 32,000 of the 35,000 bales intended for sale this week actually came to the market. Again, growers were unimpressed with the market and passed in 20.9% or 6,734 bales. This resulted in a clearance to the trade for the week of 25,455 bales, 4,359 fewer than last week. The dollar value for the week was $48.9 million, for a combined value of $1.22 billion so far this season. In the auction weeks since the winter recess, 452,634 bales have been cleared to the trade, 109,043 fewer than the same period last year. The average shortfall cleared to the trade compared to the same time last year continues to grow and now sits at 7,788 bales per week fewer. 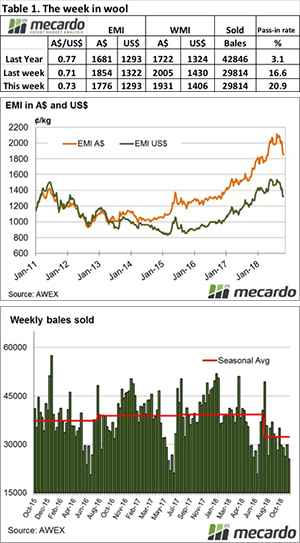 Of note is that over the past 7 weeks the EMI has fallen 237 cents or 11.7%, while the clearance to the trade has been 82,000 bales fewer than the same period last year. 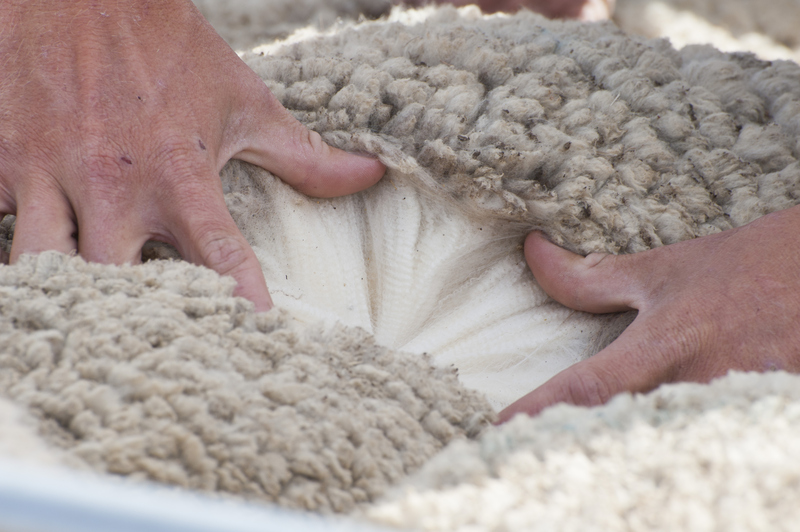 The only bit of positive news from the market this week was AWEX reporting that on Thursday there was evidence that buyers were reluctant to pass up wool with good specifications resulting in some “resolute bidding” for these types. Cardings again struggled to find support, with the Melbourne sale noting a further 6.4% fall. According to the AWEX roster, the next three weeks less than 40,000 per week are predicted, with 39,883 bales next week. After what looked like a steadier market last week, the opening on Wednesday was again a case of an accelerated decline as buyers waited for the bottom of the market to appear. Again, it would be a brave call to predict a rally next week, the best result would be a cessation of the decline.